One of the high points was that I received notification that I’ve got press accreditation to attend this year’s RHS Chelsea Flower Show, which I’m absolutely thrilled about! And I had such a lovely afternoon on Friday, attending Selina Lake‘s Pretty Pastel Style Book Launch and Fair in Kingston. I met Vicky Trainor there who I interviewed on Flowerona last year. 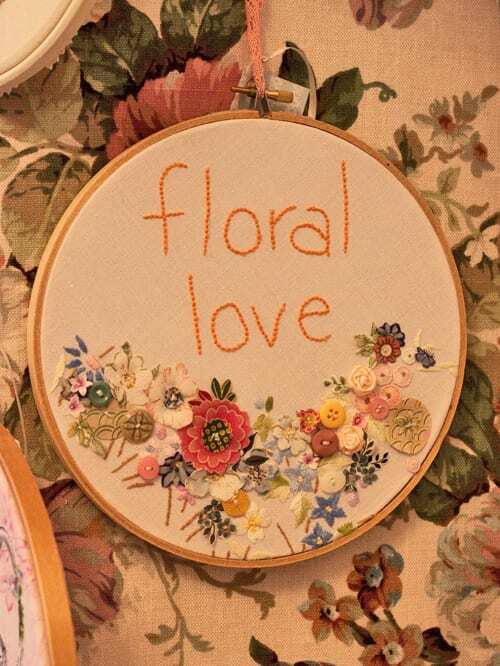 And I just had to buy the floral hoop collage above from her stall. I couldn’t wait to get home and hang it up in my office! On the low-side, unfortunately, my blog Flowerona’s been a little unwell. I’m so sorry if you’ve had problems accessing it and/or the blog posts you’ve been receiving via email have been out of kilter. GoDaddy, who host my blog, have been having issues with the speed of their servers which they’ve been trying to resolve all week…and they’re still working on it. Many thanks for your on-going patience. Mostly stay-at-home days…dealing with emails, writing blog posts, editing images and using social media. 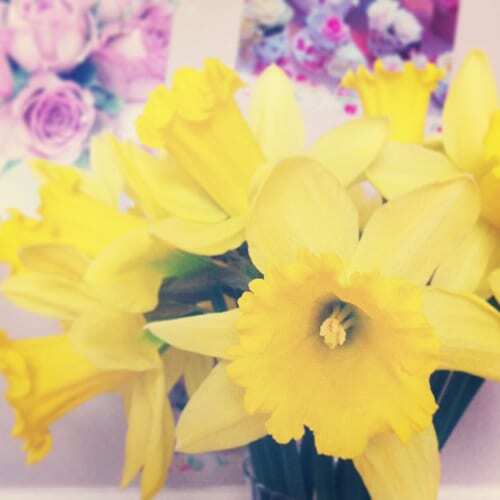 These daffodils on my desk added a lovely pop of yellow sunshine to my office. On Tuesday afternoon, I went to the Garden Museum in London to meet up with Sue Cottingham. Sue is a distributor for Serax, a Belgian company who make beautiful vases and containers. After our meeting, I took a proper look at the Floriculture exhibition at the museum and took lots of notes. The rose installation by Rebecca Louise Law was still there, with the roses ageing gracefully. 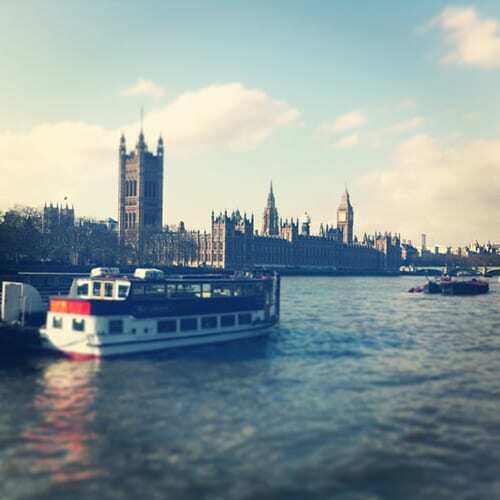 Below is the beautiful scene which greeted me as I emerged from the museum…sun shining over the Houses of Parliament by the River Thames. 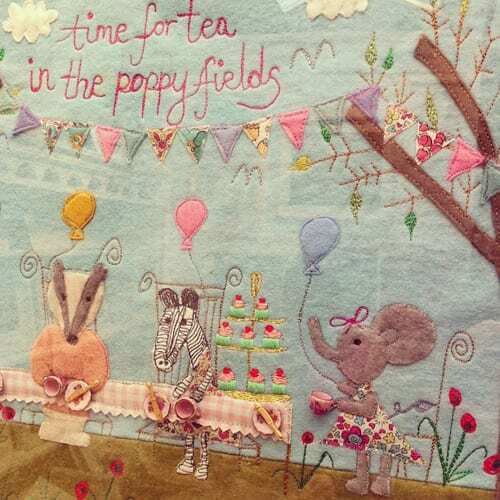 On Wednesday morning, I went to the Country Living Magazine Spring Fair in London. It was lovely to meet up with the Jane Packer team and see their gorgeous stand which I featured on Thursday. And I saw their wonderful floristry demo. I also met up with stylist Selina Lake and had a chance to catch up briefly with Jane Means, Jo Butcher, Ingrid Henningsson and Laura Rose. 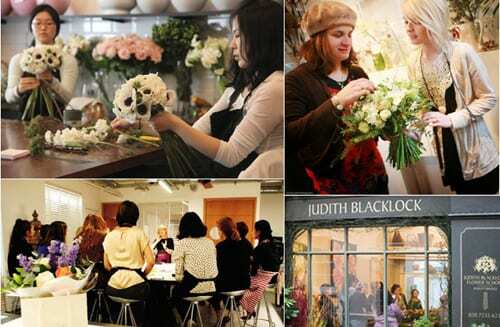 On the Laura Ashley blog, I featured an overview of some of the floristry schools in London. 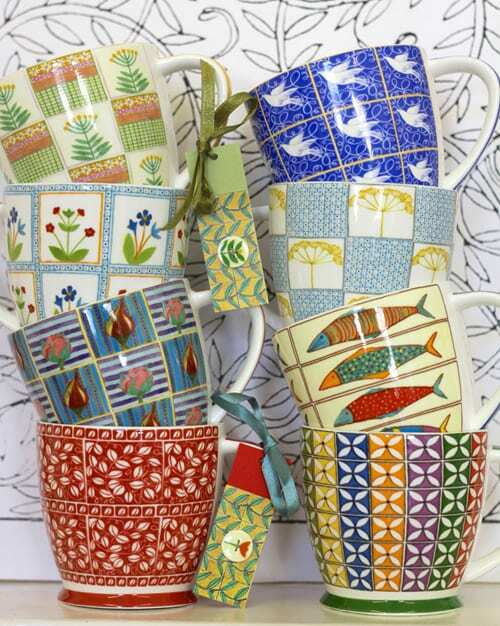 On the Heart Home blog, I featured ‘Floral-inspired mugs by Dee Hardwicke’. So, I hope you have a lovely Saturday and I’ll see you tomorrow with Flowerona Links.